To promote the new CR-V 1.6 Diesel, Honda decided they should focus on its efficient fuel consumption features. The car manufacturer claims it is making the impossible possible with their engine that uses less fuel for more driving miles. 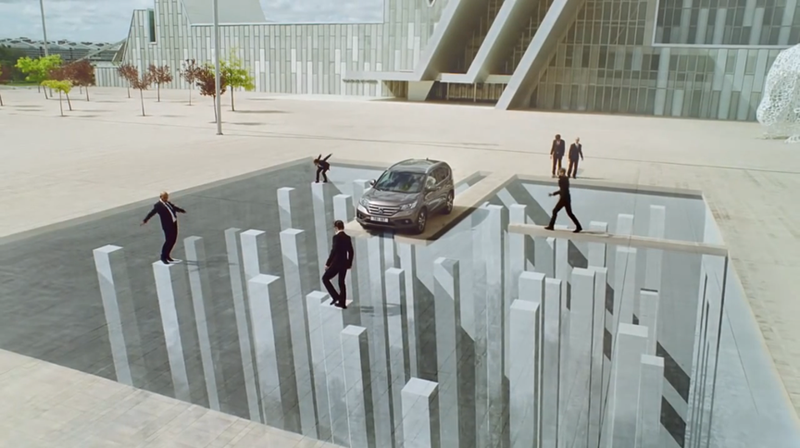 In their latest ad, they use the anamorphic technique to create visual illusions to make impossible situations possible. A very nice artistic execution and the creative idea made this video go viral, earning three million views in two weeks and a half. It would score well on raising brand awareness and on ecological positioning as most of the viewers would like to know what’s the relation between the impressive visuals and the car. Previous Post They Grab Men’s Balls To Raise Money And Fight Male’s Cancers!